Horizontal push and pull folding door, from a number of doors into a stable form of triangular connection, strong wind resistance, sealing effect is good, light weight, flexible operation, can be manually or electrically open and close. 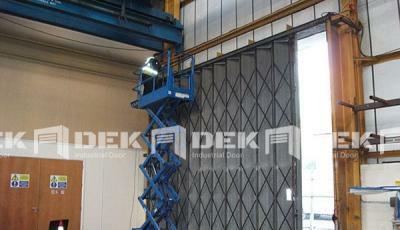 Door material is made of deep hot dip galvanized steel or stainless steel plate. Door thickness is 0.8mm and 1.2mm optional. All the non fixed edges are provided with a shrinking edge guiding post and an operating handle. The electric folding door drive system torque limiting device allows the door to be damaged by a continuous chain drive system. Equipped with standard folding door hasp lock.